Penguin Press HC, The, 9781594202094, 368pp. A century ago, Luther Burbank was the most famous gardener on the planet. His name was inseparable from a cornucopia of new and improved plants--fruits, nuts, vegetables, and flowers--for both home gardens and commercial farms and orchards. At a time when the science of genetics was in its infancy and agriculture was often a perilous combination of guess work and luck, many people wanted a piece of the man they called the Wizard of Santa Rosa. As the United States moved from a nation of farms to a nation of city dwellers, the people behind the new products that transformed daily life were admired with a fervor that is not accorded to their present-day counterparts. Everyone knew and marveled at Samuel Morse's telegraph, Alexander Graham Bell's telephone, and Thomas Edison's electric light. And like these other great American inventors, Burbank was revered as an example of the best tradition of American originality, ingenuity, and perseverance. 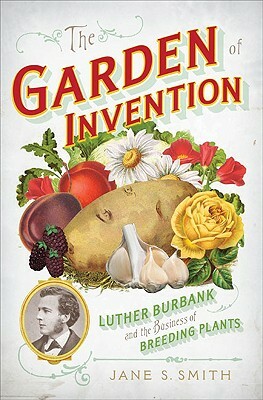 Burbank had learned the secret of teaching nature to perform for man, breeding and crossbreeding ordinary plants from farm and garden until they were tastier, hardier, and more productive than ever before. The Garden of Invention is neither an encyclopedia nor a biography. Rather, Jane S. Smith, a noted cultural historian, highlights significant moments in Burbank's life (itself a fascinating story) and uses them to explore larger trends that he embodied and, in some cases, shaped. The Garden of Invention revisits the early years of bioengineering, when plant inventors were popular heroes and the public clamored for new varieties that would extend seasons, increase yields, look beautiful, or simply be wonderfully different from anything seen before. The road from the nineteenth-century farm to twenty-first-century agribusiness is full of twists and turns, of course, but a good part of it passed straight through Luther Burbank's garden. The Garden of Invention is a colorful and engrossing examination of the intersection of gardening, science, and business in the years between the Civil War and the Great Depression.